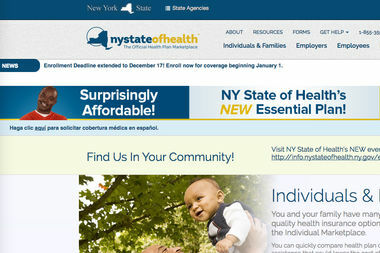 Open enrollment for health insurance through the New York state's exchange ends Tuesday, Jan. 31. NEW YORK CITY — Today is your last chance to sign up for a 2017 health insurance plan through New York state's Affordable Care Act marketplace. For New Yorkers enrolling or renewing their current policy by 11:59 p.m. Tuesday, Jan. 31, coverage will start on March 1. More than 3.5 million state residents have purchased health insurance through the New York State of Health since this year's open enrollment period launched Nov. 1, according to the exchange's executive director, Donna Frescatore. That's at least a 25 percent increase over enrollment numbers in 2016, when more than 2.8 million New Yorkers — 15 percent of the state's population — registered. More than half of them were in New York City. Demand for plans under Affordable Care Act, commonly known as Obamacare, has grown in spite of President Donald Trump's executive order directing his staff to repeal and replace the statute enacted in 2010. New York City officials took a stand against an ACA repeal in December with the launch of a campaign to enroll as many as 50,000 new beneficiaries in state exchange health plans over a period of 12 months. "We as New Yorkers need to fight back," Mayor Bill de Blasio said at a press conference announcing the initiative. "And right now, one of the best ways to fight back is to sign up the maximum number of people for health insurance under the Affordable Care Act." The city is keeping enrollment facilities, where residents can find in-person assistance, open until as late as 9 p.m. Tuesday. New Yorkers can also sign up online. The federal government imposes a fee on citizens who can afford insurance but choose not to enroll. The majority of New Yorkers will only qualify for enrollment after the deadline in the case of life-changing circumstances, like marriage or loss of employment. But low-income individuals and families can sign up for a $20-a-month-per-person plan all year long.